First Up – I’d had some pure merino roving in two different colours since i first got my wheel, which i’d always planned on plying together. So! that’s what i did! Second – Again, some merino I picked up ages ago at the Handweavers and Spinners guild of victoria. This was a gorgeous multidyed blue based roving, which had been dyed seperately and then carded together (rather than hand dyed). I considered plying with a solid colour, but in the end i just practiced my fineness and evenness and 2 plied the yarn with itself. This one i named Mariana after the Underwater trench in the pacific. I’m sure the Mariana Trench is actually pitch black but these are such beautiful underwatery colours that the name just fit. 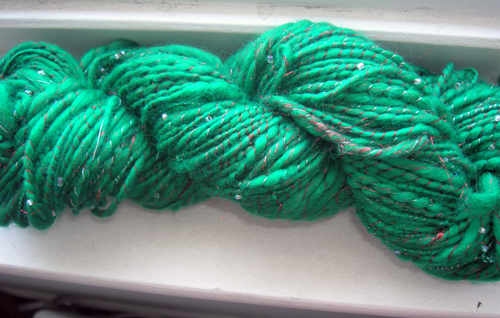 This one is about 92m and a heavy worsted weight at 8 wpi. Third – Fractal Spinning!! 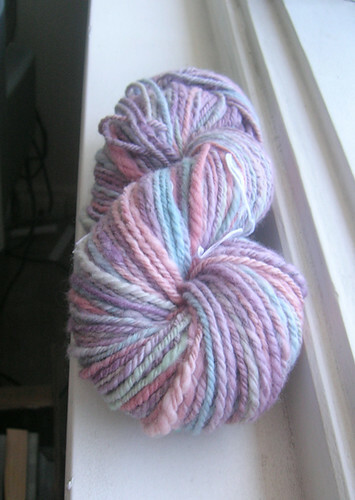 I received some beautifully hand dyed Norwegian roving from Ewe Give Me The Knits! in a ravelry swap. The colours ranged from bright red through pink and orange, great combination, but not for me, so i had the ingenious idea of spinning it up for my new friend S who is a total orange girl!! Since the colours were really clear i decided to try Fractal Spinning – this is a technique for getting a less randomised colouring through the yarn The basic idea is to split the roving into two halves – one which is spun with one full colour repeat (ie as is) and the other split three or four times and spun in multiple colour repeats. Depending on how the original colours are spaced, the colours should start to line up like so AA, AB, AC, BA, BB, BC, CA, CB, CC. Fourth! My friend E is a felter and had a whole pile of beautifully coloured merino slivers left over. she gave them to me for spinning, suggesting i put all the colours (she’s a quilter so she spends a lot of time putting colours together) in the one yarn. She’s also suggested that were i to make something out of it for her, that might not be a bad thing lol. Five (omg) Is another Christmas present! 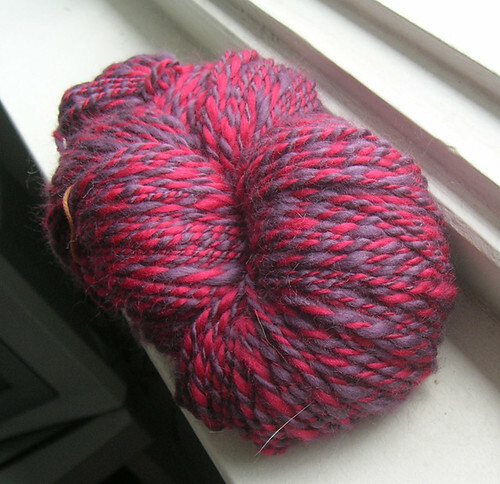 I went and picked out a beautiful red based merino and silk blend at the spinner’s guild. The plum red is flecked with white and black and is just gorgeous! SJ had commented that she loved the smooshiness of my early yarns so i deliberately spun the first single thick and thin with a lot of smoosh factor. 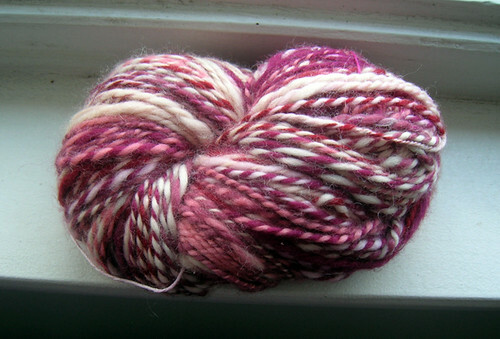 The other single i spun as evenly as i could (i do need to practice lol) and then plied the two together. SJ loved it, and the 15% silk really does add a real shine! Seven (phew) My first Silk Hanky! 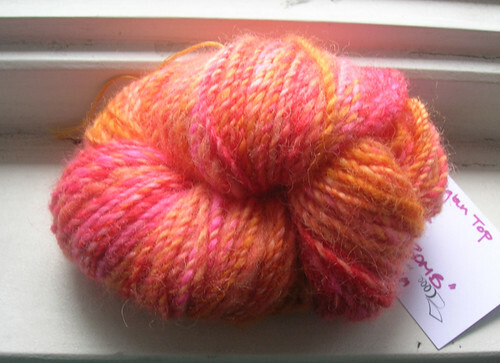 This was spun on the spindle and was a lot of fun. and i just lurrrrve the colour. 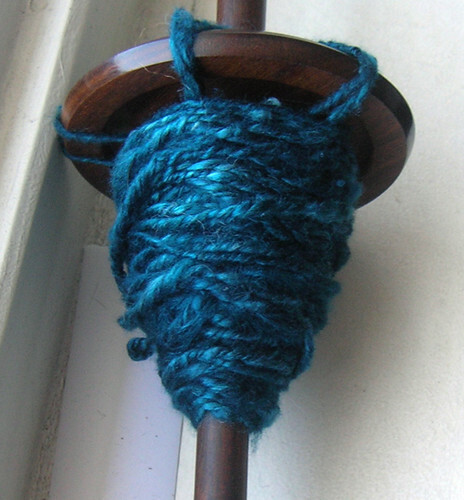 I navajo plied after i spun the single – also on the spindle, but not on the fly. 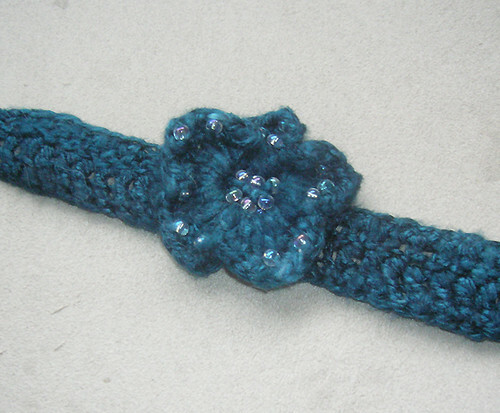 D came over and commented on the colour – so it ended up being her christmas present in the form of a crocheted choker! 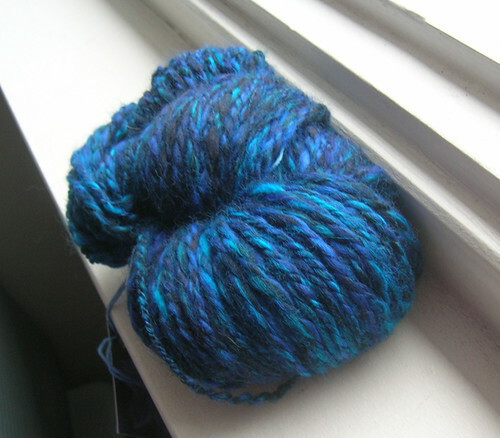 And Last but not Least – My first Art Yarn! Mandie at Ewe Give Me the Knits kindly carded some gorgeous green merino with red wing flash angelina. I spun it nice and thick (and not so thick) and plied it with a cranberry variegated plying thread which i’d strung with seed beads! Wow. was that a lot of work! the single kept breaking, the beads got tangled, the plying thread doubled back on itself… but i love the result: A christmas yarn for the spin up challenge at the Ewe Give Me the Knits group on Rav. Named for the holly green colour and the season of course! 104, 113g, and i haven’t bothered to take wip reading… it’s to varied.